Affordable, long-lasting floor protection for home or office. 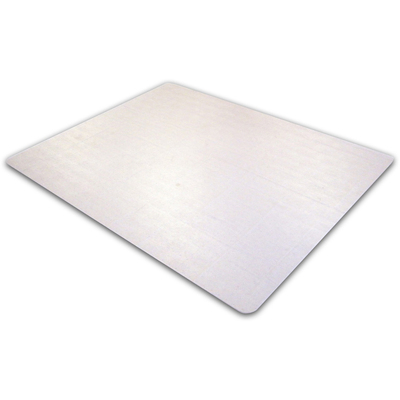 Unique formulation delivers the clearest, most durable PVC mat. Free from the phthalate plasticizers that have been banned from children's toys and medical instruments. Also free of tin, lead and cadmium content. Will not to crack, chip, break or shatter in normal use and correct application. Gripper back for low pile carpets up to 1/4" holds mat securely in place. Manufactured using up to 30% renewable energy. Affordable, long-lasting protection for home or office. Unique formulation delivers the clearest, most durable PVC mat. Free from the phthalate plasticizers that have been banned from children's toys and medical instruments. Gripper back holds mat securely in place. Will not to crack, chip, break or shatter in normal use and correct application. Manufactured using up to 30% renewable energy. Gripper back for low pile carpets up to 1/4".